We have the best, easy to use and easy to setup, Karaoke Systems and Karaoke Mics / Microphones on rent. We have several packages of Karaoke equipment available for rent. We can deliver the equipment at your venue location anywhere in Mumbai and also provide staff and personnel to manage and take responsibility of the setup and equipment while you focus on socializing with the guests at your event. 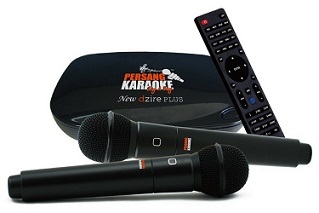 We use Persang brand Karaoke systems, a company that is currently the market-leader in India for Karaoke Technology. The Karaoke System has more than 8000+ songs. The ENTIRE SONG LIST can be viewed and downloaded as a PDF file at this link (6.8 MB download). SkyAV © 2017 Sky AV is an 8-year old Audio-Video Equipment Rental Company based in Mumbai. We provide Karaoke Mics / Karaoke Systems / Karaoke Machines on Rent in Mumbai, Karaoke Mics / Karaoke Systems / Karaoke Machines on Hire in Mumbai, Karaoke Mics / Karaoke Systems / Karaoke Machines Rentals in Mumbai, and also deliver all over Mumbai.